Elmer Becker, 89, of Winthrop, died Monday, Nov. 16, 2015, at the Winthrop Good Samaritan Society in Winthrop. Honorary casket bearers were his grandchildren, April Painter, Laura Karnik, Paula Rannow, Sarah Heber, Amanda Wentink, Lisa Stenzel, RaNaye Carrigan, Tiffany Meisler, Dan Nelson, Kate Broseth and Crystal Heldt. Casket bearers were his grandchildren, Nathan Trout, Lucas Youngblom, Darren Carrigan, Melissa Ostlund, Kate Maiers and Mariah Shepersky. Elmer Henry Becker was born Nov. 25, 1925, in Penn Township, McLeod County, the son of Fred and Ida (Otto) Becker. He was baptized as an infant on Jan. 26, 1926, by the Rev. 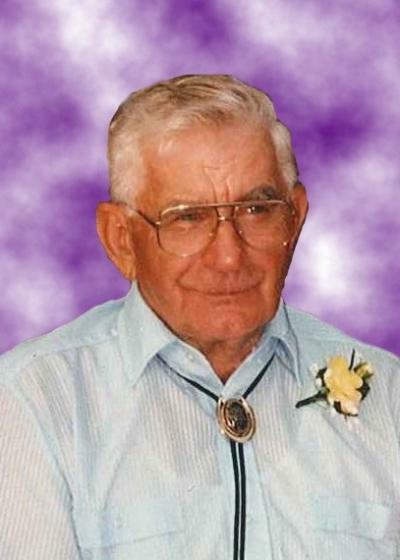 George Diemer, and was confirmed in his faith as a youth on April 2, 1939, by the Rev. Walter Diemer, both at St. Matthew’s Lutheran Church in Penn Township. He was educated at country School District 16. On July 1, 1951, he was united in marriage to Clara Gutknecht at St. John’s Lutheran Church, Bismarck Township, by the Rev. Alex Schira. Their marriage was blessed with six daughters. After their marriage, the couple farmed in Bismarck Township, Sibley County, for many years. After retirement, they both worked part time at JB Lures in Winthrop for several years. They shared 55 years of marriage before Mrs. Becker’s death on Feb. 15, 2007. Mr. Becker was a member of St. Matthew’s Lutheran Church in Penn Township and recently became a member of Grace Lutheran Church in Brownton. He enjoyed playing cards, dancing, fishing and gardening. He loved spending time with his family, especially his children, grandchildren and great-grandchildren. He moved to Winthrop Good Samaritan Society in Winthrop when he needed assistance with his daily care. He is survived by his children, Diane (Marlow) Knuth of Dassel, LaVonne (Craig) Nelson of Darwin, Barbara (Tom) Trout of Loveland, Colorado, Sharon (David) Carrigan of Winthrop and Cynthia (Robert) Youngblom of Lafayette; son-in-law, David Stenzel of Winthrop; 17 grandchildren, Melissa Ostlund, April Painter, Laura (Neil) Karnik, Paula (Caleb) Rannow, Dan Nelson, Kate (Drew) Broseth, Mariah (Kevin) Shepersky, Crystal (Jared) Heldt, Kate (Jon) Maiers, Lisa Stenzel, Sarah (Troy) Heber, Nathan (Anissa) Trout, Amanda (Paul) Wentink, Darren (Cassandra) Carrigan, RaNaye Carrigan, Tiffany (Chris) Meisler and Lucas (Kayla) Youngblom; 29 great-grandchildren; sister, Rosie Ehlers of Hutchinson; brothers-in-law and sisters-in-law, Beverly Becker, Myrtice Becker, Otto Gutknecht, Helen (Ellsworth) Becker and Larry (Sharon) Gutknecht; numerous nieces, nephews and friends. He was preceded in death by his wife, Clara Becker; daughter, Rhonda Stenzel; grandsons, Robert Stenzel, John Stenzel and Jason Samuelson; parents, Fred and Ida Becker; father-in-law and mother-in-law, Arthur and Hertha Gutknecht; siblings, Leonhard (Esther) Becker, Raymond (Helen) Becker, Oda (Clarence) Comnick, Halbert Becker, Linda (Ebert) Schuch, Gerhard Becker and Arlene (Elmer) Burdorf; sisters-in-law and brothers-in-law, Melva Becker, Ann Gutknecht and Arthur Ehlers. Arrangements were with the Dalin-Hantge Funeral Chapel in Winthrop. Online obituaries and guest book are available at www.hantge.com.